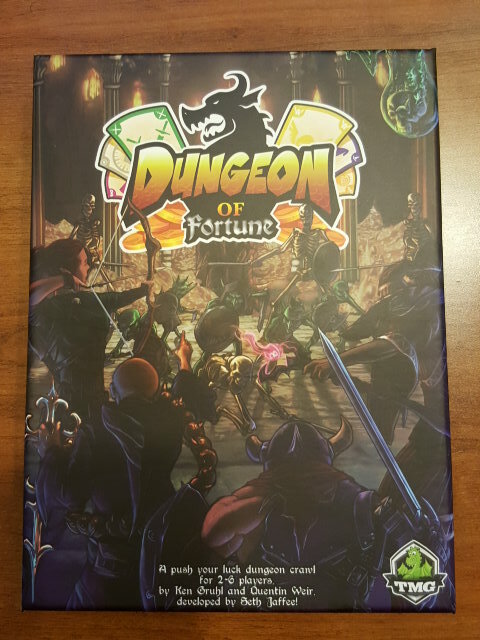 Dungeon of Fortune is the new push-your-luck game that is set in the same universe as Dungeon Roll, an earlier game also published by TMG. In this small box game, players fight with each other to retrieve the most valuable loot from the dungeon. Each player is given a player board to start the game – there are 12 different ones to choose from. Each character comes with a different special ability, located in the upper left corner. There is a track at the top of the board that helps you track what Dungeon level that you are currently on, and there is a track on the right side of the board that keeps track of your own personal skill level. You will get some companion tokens corresponding to your starting level. The proscribed number of loot tokens are counted out (face down) – each has between one and three coins on the hidden side or possibly a Gem. On each turn, players take turn exploring the dungeon or trying to stash their treasure. If you choose to explore the dungeon, you draw the top card from the deck. There are three different types of cards that can come up: a dungeon card, a Pilfer card, and a Dragon card. The Dungeon card has a number of lines of icons on it, and you have to deal with the line of icons that corresponds to your current dungeon level (as indicated by the track on the top of your character card). You will have to deal with a combination of monsters and/or loot. If you are unable to deal with the monsters on your line of the card, you are forced to flee the dungeon. To defeat monsters, you can use your companion tokens. The blue token can defeat one single monster of any color or ALL blue monsters. The green token can defeat one single monster of any color or ALL green monsters. The grey token can defeat one single monster of any color or ALL grey monsters. The purple token can be used to defeat one single monster. A Champion token can defeat all monsters of a single type. Any companion tokens used to defeat monsters are flipped over. These companion tokens cannot be used again this round. They remain in the Party space though. There are two types of loot. If you see a treasure icon (coin), you simply choose a facedown loot token and place it on the pouch on your board. If there is a chest, this is locked, and you have to use your companion tokens to open it. The blue, green and grey companions can each open a single chest while the purple companion or a Champion can open any number of chests. Any tokens used to open chests are NOT flipped over, and they are moved to the purple treasure area on your board – you will not gain experience points for opening chests. These companion tokens cannot be used again this round. For each chest that is opened, you take a facedown Loot token and place it on your board. A Pilfer card allows you to steal a single Loot token from any other player – from their Pouch or their Satchel. A Dragon card initially does nothing. Heck, a second Dragon card in a round doesn’t do anything. But, if you get your third Dragon card, then you have to defeat the Dragon or you are forced to flee. 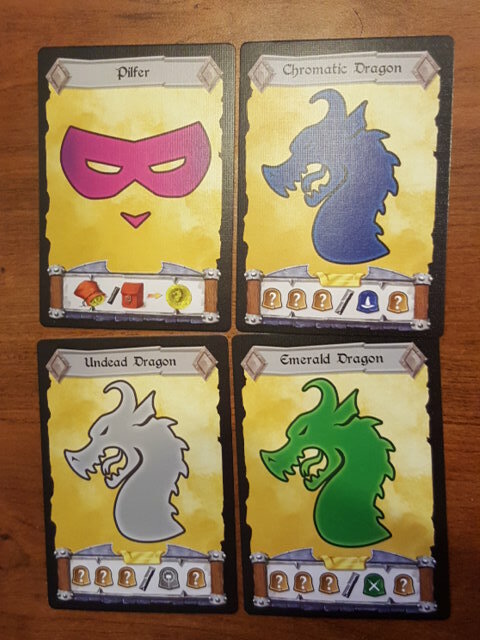 You need any three companions to defeat the Dragon, though each Dragon is specifically susceptible to one of the four types (as shown on the bottom of the card) – so you may only need 2 tokens. Any tokens used to defeat the Dragon are flipped over and moved to the XP side. If you are able to defeat the Dragon, you collect two Loot tokens and place it on your purse. At any point, if you are forced to flee the Dungeon – because you cannot defeat the monsters on a Dungeon card or defeat the Dragon (on your third Dragon card) – you must leave without anything. Any collected Loot tokens on your pouch area are returned to the supply. Any flipped over tokens in your party space (which were pending Experience points) are also returned to the supply. Note that you do not return any Loot tokens in your Satchel nor do you return previously collected Experience tokens that are in your green XP area. Once you have fled, you are out of this round and will not take any more turns in this round. Instead of taking a card, you could choose to Stash your Treasure. When you do this, you voluntarily remove yourself from the rest of the round. You move any Loot tokens on your Pouch to your Satchel, and you move and flipped over tokens from your Party area to the Green “XP” area. You then look at all of the cards that you have seen this turn, and if you have enough staircase icons on those cards as the next level on your Dungeon track, you are able to move deeper into the Dungeon. You may only descend one level per round. You also then check to see if you level up from your gained Experience. On the personal level track on the right of the board, each level is separated by a number of Experience icons. If you have collected enough icons in your green XP area, you spend them to move up to the next level. There is no limit to the number of levels that you can gain in a round. As you gain levels, your companions will change. When there is only one player left in the Round (because all other players have either Fled or Stashed Treasure), the last remaining player instantly gains two Loot tokens in their Satchel as a reward for their bravery. That player continues the round until they either are forced to flee or choose to stash Treasure. In the next round, the player who earned the Bravery bonus will be the starting player of the next round. The game continues until the last Loot token is collected from the Supply. The game ends immediately at this time. All players now flip over all Loot tokens on their board (both in the Pouch and Satchel areas) and count up. Loot tokens with coins on them are worth 1,2 or 3 points depending on what is depicted. Loot tokens with Gems are worth one point per gem of that type that you have collected. Additionally, you score 1 point for every experience token in your XP area as well as in your Party area. The player with the most points wins! 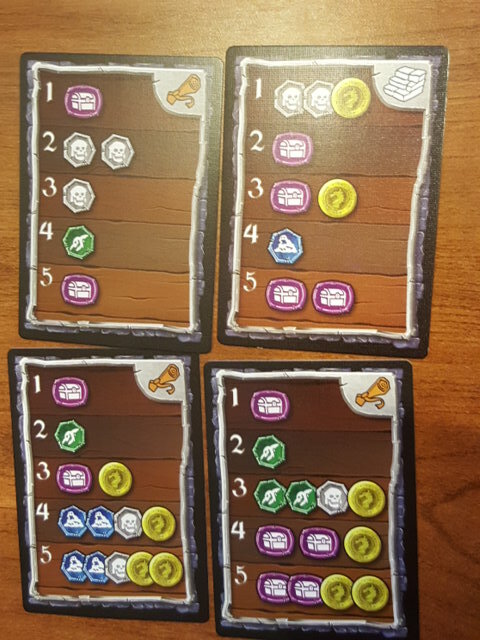 It is important to note that there is a rule that was left out of the first edition of the rulebook: Advanced variant: Some cards have a Scroll icon in the upper right corner. When drawing a new card, you may discard a card already in your display that has a scroll on it in order to ignore the new card and draw again. Discard the ignored card and encounter the replacement instead. 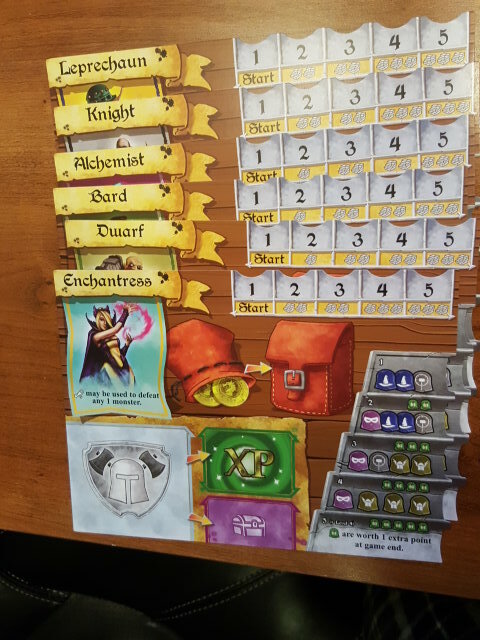 Dungeon of Fortune is a fun little game that is super easy to teach. I’ve had a good time playing this with the boys and their friends. We were a bit confused at first because we didn’t know that there was a rule missing from the rulebook, but a little bit of investigation online fixed this issue. Each of the characters has a slightly different basic special ability, and this helps each game feel a little different. Furthermore, each character has a different super ability that you get when you reach Level 5. After a few games, I’m not sure if the abilities of the characters are exactly balanced with each other, but none has proven to be gamebreaking when considered against the others. The exploration part of the game is very unpredictable because of the differing values that can be found on the cards. Some dungeon cards may have a single monster or chest on a level, while other levels may have as many as three or four monsters! This unpredictability definitely adds a little bit of excitement/tension to the game. I’m personally not a big fan of the Pilfer cards as it has targeted stealing, but there are only 8 of them in the entire deck of 80 cards, so it’s not something that comes up too much. 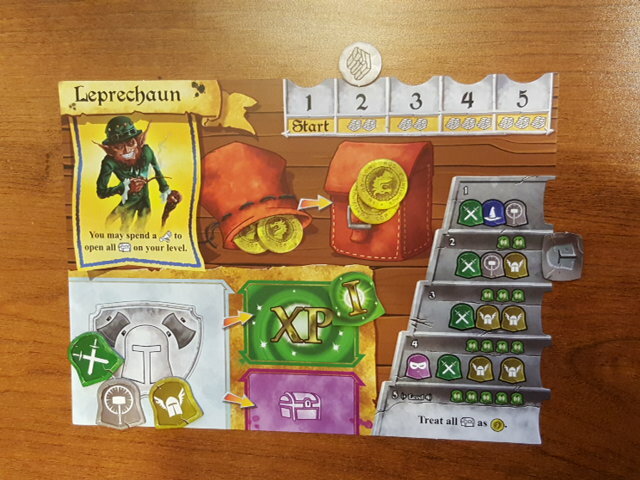 Production wise – the cards are a sturdy stock and have held up well in our initial games. The artwork is nicely done and keeps the theme from the initial Dungeon Roll game. The rules are not the best – as mentioned earlier, there is a significant rule missing from the rule book and there are a number of typos as well. It appears that a new rulebook is being uploaded online – and hopefully new players to the game will somehow figure out that the rules aren’t complete. The champion tokens are not positively identified in the rules either, but we ended up figuring this out as a matter of elimination. Dungeon of Fortune is sitting in filler role for the fall, and we’ll see how long it stays in that position (this will likely be determined by how much the kids want to keep playing it).